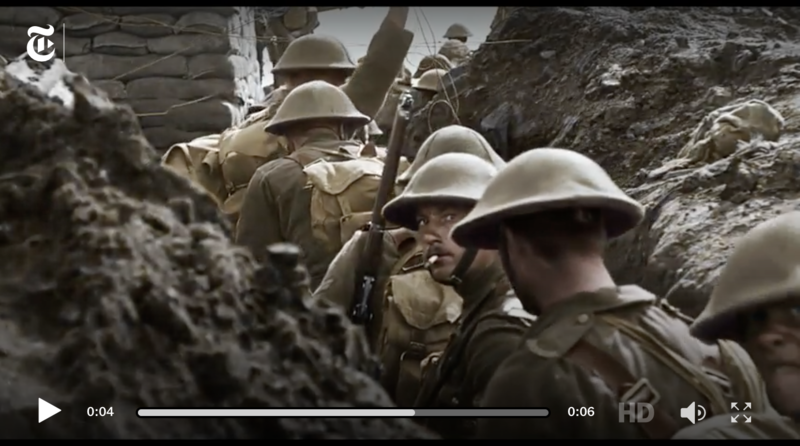 Reader Rick called my attention to this New York Times article on Peter Jackson‘s new film, “They Shall Not Grow Old“: a documentary about World War I. (Jackson, as I’m sure you know, is the New Zealand-born director famous for filming the Lord of the Rings trilogy). All the film’s footage is archival, but Jackson has tweaked it in some amazing ways, including colorizing the old stuff, removing the schmutz, and fixing the jerkiness. If you go to the Times article you can see four very short segments of the archival film before and after Jackson’s treatment, and what he’s done is absolutely stunning. Here’s the trailer for the film. You’ll notice the preponderance of bad teeth in these soldiers! I can’t embed the very short NYT videos below, which show the transformation of old footage into the present movie, but I’ve put in three screenshots. Go to the link above to see the videos. I’ve put some text from the article between the screenshots. 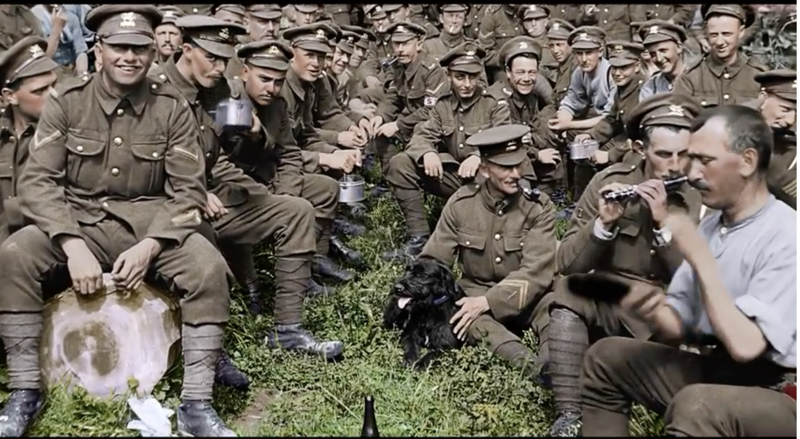 With “They Shall Not Grow Old,” Jackson has applied new technology to century-old World War I footage to create a vivid, you-are-there feeling that puts real faces front and center and allows us to hear their stories in their own words. The documentary, which will screen nationwide Dec. 17 and Dec. 27,concentrates on the experiences of British soldiers as revealed in footage from the archives of the Imperial War Museum. Jackson and his team have digitally restored the footage, adjusted its frame rate, colorized it and converted it to 3-D. They chose not to add a host or title cards. Instead, veterans of the war “narrate” — that is, the filmmakers culled their commentary from hundreds of hours of BBC interviews recorded in the 1960s and ’70s. For Jackson’s documentary, rather than sift through the archival footage to decide which scenes to use, he opted to restore all 100 hours first (working on that daunting three-year task with a New Zealand company, Park Road Post Production). Decades of scratches, dust and splotches were cleaned up, and the now-pristine material was donated back to the war museum. There were other technological adjustments as well. Jackson’s goal was to reconnect audiences with the soldiers in a way even more intimate than “The Battle of the Somme” did. The footage had a herky-jerky feel because it had been shot on hand-cranked cameras that produced images at a much slower frame rate than modern audiences are used to. Jackson’s team retimed the footage, speeding up the frame rate, adding extra frames digitally and smoothing out the movement. Then Jackson turned to the company Stereo D to colorize the film’s centerpiece clips. This required the help of a historian who could identify the military details, down to what colors uniform buttons should be. Additionally, Jackson’s team traveled to some of the battle sites to pin down color references. Stereo D also worked on converting the film to 3-D for a more immersive effect, a sense of being on the battlefield. And Park Road enhanced the experience with sound editing to rival that of “The Lord of the Rings.” Butexplosions, gunshots and tank engines aren’t as surprising as the moments when the soldiers speak. “We got some forensic lip readers, who, before this, I had no idea actually existed,” Jackson said. These experts, who often work with law enforcement to help determine the words of people in security camera video, reviewed the archival footage to reconstruct, as nearly as possible, what the soldiers were saying. Voice performers were hired to stand in for the soldiers, but Jackson’s team, mindful that regiments were drawn from different regions of Britain, made sure the actors came from those areas and had accurate accents. In a similar vein, military historians provided ideas for what off-camera officers’ commands might have been, and that information made its way into the film as well. Fricking amazing! Jackson is such a hard worker and stickler for details. This is one film I’ll surely watch. “They Shall Not Grow Old” is playing in the U.S. today and on December 27. This entry was written by whyevolutionistrue and posted on December 17, 2018 at 2:30 pm and filed under movies, war. Bookmark the permalink. Follow any comments here with the RSS feed for this post. Both comments and trackbacks are currently closed. The film was released recently in New Zealand and I have seen it. I have been watching movies for over 50 years and this is definitely in the top bracket: extraordinary. There are scenes in it that are hard to erase from the memory; the look of dull fear of men waiting for the command to go over the top, scarifying. The early scenes of young chaps waiting to register revealed extreme tooth damage and loss. Don’t miss it. If you think back to when WWI was and all the medical and technological advancements we’ve made, it’s not surprising people were in a bad way with their teeth. I’m glad we have improved things! On a recent BBC podcast, I forget which one, they mentioned that toothbrushes were issued as part of a soldier’s kit for the first time in WWI, but they mostly used them for cleaning their buttons or boots and didntl come into general oral usage until after the war. The British army’s idea of dental care was to remove teeth at the first sign of tooth ache . My late father told me his dad was on The Somme ,don’t think it improved his temper a great deal . Nowadays at least you get shot to pieces with all your ivories intact! You’d think that a life in the trenches would be bad for you. Well, obviously it was in many ways, but in terms of nutrition. a lot of the men were better fed by the army than they had been in their civilian lives. Poeple didn’t even live that long due to lack of immunization and other diseases that are preventable now. If you lived to 60 you were really lucky. I think the average male was kaput by his 50s. The British army on the Western front even when the front was quiet lost 7000 officers and men a day killed and wounded . Well so says Paul Fussell ,in The great war and modern memory . This came out in the UK a few weeks ago, and I made sure I saw it at the cinema in 3D. It was then shown a couple of days later on TV. It’s astonishing what Jackson managed to do with the historical footage, most of which had never been seen before. What I found amazing is that the soldiers managed to keep such a sense of humour throughout, some even going so far as to imply they almost enjoyed the experience. The scenes with the German prisoner soldiers were especially poignant, when soldiers on opposing sides came face to face, and realised they were the same, and actually became almost friends. Your comment made me think of the famous spontaneous “Christmas truce” of 1914 in northern France, when a Brit soldier singing “Tommy Lad” from one of the trenches ended up inspiring the soldiers on both sides to come out of their trenches and meet in no-man’s land. George: Yes, that’s right. I’d just arrived and we had that wonderful Christmas truce. Do you remember, sir? We could hear “Silent Night” drifting across the still, clear air of No Man’s Land. And then they came, the Germans, emerging out of the freezing night mist, calling to us, and we clambered up over the top and went to meet them. Edmund: Both sides advanced more during one Christmas piss-up than they managed in the next two-and-a-half years of war. Baldrick: Do you remember the football match? Edmund: Remember it? How could I forget it? I was never offside! I could not believe that decision! I saw this on the BBC on 11 Nov earlier this year and it was one of the most extraordinary films that I have ever seen. Just see it. As well as being a technical wonder the film was extraordinarily moving. The fear on some of the young boys faces was heartbreaking. I can forgive Jackson the mis-quote of Binyon’s verse. I hope it isn’t edited in the same general manner as the trailer. Changing shots every 1 second or even faster would render it unwatchable no matter how well it’s been restored. If anybody who has seen it can advise on that aspect I’d be grateful, because going by that trailer I’m otherwise uninterested. I can put your mind at rest. The trailer is just that: a trailer with snapshots of the film. Most shots, especially during the core of the film, last at least half a minute or even longer ( being limited to the capacity of the hand cracked cameras of the day). It is one of the most moving films that I have seen in recent years. Not only do I want to see this film, I’m hoping they also made a “Making of …” film. They did this in a BBC series called What do Artists Do All Day. Please watch the whole thing. It is very evocative and moving. 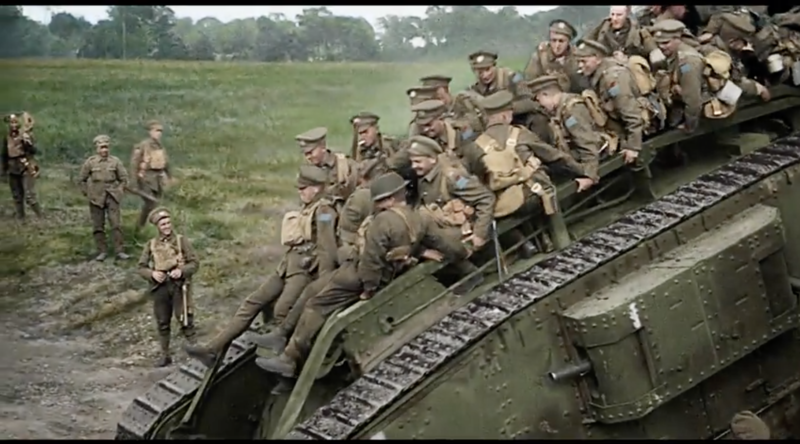 Jackson has done wonders with the archive footage; and the IWM’s recorded voices brought tears to my eyes. My grandfather was gassed at Passchendaele in 1917 and nearly lost his sight. Before the war he was a stalwart of the local Congregational church and its choir; after it, he never set foot in a church again. (I still have his annotated copies of Handel’s ‘Messiah’ and Stainer’s ‘Crucifixion’). This film really brings home what it must have been like. Admittedly, most of the battle scenes are staged – getting a camera into the front line was an impossibility – but there are quite enough images of the ghastly results of war almost to turn one pacifist. PS: one of the graceful touches is that, in the credits, Jackson names and honours every one of the warriors whose words are used in the film. Assuming the info at FATHOM EVENTS is accurate, it’s only showing on the 17th Dec & 27th Dec in the USA. And your three options are all two hours away [130 miles approx] at Manhattan, Topeka & Stillwater. Yes, I saw that. I have to believe it will come here eventually. Since it’s been on TV in Britain it should be here at some time. Makes no sense really, Wichita is much larger than any of those places. 3D cinema availability on those two days – the Wichita ones already booked up is my guess. I was knocked on my heels watching the trailer when I recognized the cap badge of the Gloucestershire Regt, my old regiment, 1 Glosters. This is fantastic. What a gift to the world and history. I can’t wait to see it. It’s an amazing film for sure. BBC4 also showed an episode of What Do Artists do All Day? which is a behind the scenes look at how they made the film. Jackson has a deep interest in the 1st World War, and personally owns a lot of memorabilia, so the detail they went into is pretty amazing. Although the full program is not available currently, people may be able to find it elsewhere, and there are a few clips at the link. Thanks for the info. The series looks great. Unfortunately, the specific episode is not available yet here(US?). But, I watched another and it’s really very good stuff. I’ve bookmarked it for those rainy days. Jackson has designed WW1 displays at the Omaka Aviation Heritage Centre, Blenheim, Marlborough in New Zealand. The displays include many of Jacksons’ personal collection of WW1 planes and artefacts. Looking forward to seeing this. I actually read a negative review of this a few weeks back. The critic suggested something along the lines of this prettying up History. It’s brilliant. I saw it a few weeks ago. I also noticed the state of the teeth! i just checked, and the dvd is available from amazon for ten or so of your American dollars. It’s an astonishing piece of work; Jackson seems to veer from the sublime to the execrable with very little in between. I’m not finding it on Amazon. Note, however… Playback Region 2 :This will not play on most DVD players sold in the U.S., U.S. Territories, Canada, and Bermuda. See other DVD options under “Other Formats & Versions”. Thanks for the head’s up on this. Will check it out on amazon. There’s presumably actors beefing up the voices? They got professional lip readers to figure out what the people were saying and they used actors to say the words. Sorry, just realised it says that in the post. The Atlantic has an entire archive of WWI photos. Of course, they are in their original black and white. Perhaps, Jackson will work on them some day. In any case, they are well worth looking at to get a taste of that terrible war. Before anyone gets excited about DVDs, remember – the machine playing it has to be the correct region code or whatever. I never worried about that before so buyer beware. Depends on how old your DVD player is ,some new ones will play any DVD. Its an astonishing piece of film making. Jackson has given these people a voice and made them look and sound immediate rather than distant. There was an audible gasp around the cinema when it went into color so powerful is the effect. At the end of the screening the audience just sat there, after the credits rolled. I’ve never seen that before. I can’t help wondering how accurate the colourising is. Have they been able to faithfully reproduced dirt and mud on uniforms and machinery or have they made them look too clean with the colour filling? I’ve done some color correction/grading myself and also some colorization of stills. It’s often a painstaking and time consuming process. I’d be interested to see how this film was processed. How much is manual and how much can be passed off to algorithms. The write-up mentions the funding limitations, and I suspect the processing was quite expensive. I have watched the Film and it is mindblowing, the sharpness of the images and the smoothness is truly astonishing, the colour of the Uniforms is accurate, as the Uniforms I was issued with were made of the same material. Everyone should see this Film, especially School Children. I think this will mark an increase in films that use this technological approach, bringing early film to modern audiences. I assume this has been done before but a big name like Jackson with a compelling story telling seems to signal that it’s ok for studios to fund things like it. It’s already available on iTunes (in the UK at least). Drew a blank on Netflix and Amazon though. Astonishing. I worry though about the same stuff being used for “deep fakes”. I’m going to be the lone curmudgeon and voice some displeasure. I realize that much of the public refuses to watch film in black and white, let alone silent b&w film, but I personally find the idea of colorizing and adding sound to archive footage a very patronizing one. And rather dangerous, since it might help condition the public to demand that any archival footage shown on TV or for a mass audience will receive the same sweetening. It doesn’t seem fair to call the process used on this film as “sweetening”. Every attempt was made to make the film a more accurate rendering of true life. Of course, if your desire is an accurate account of the limitations of 100-year-old film technology, then stick with the original footage. But it is sweetening–Jackson has added color, audio dialogue, and even monkeyed with the frame rate. None of this is a more accurate rendering of true life, but a mimicry of what the footage might have looked like if shot in 2018. I know I’m in the minority in my reaction, and I certainly don’t begrudge the general public for gaining a heightened interest in WWI through this film. I think it is completely wrong to call this “sweetening” and to claim that this isn’t a more accurate rendering. That requires one to imagine that life in 1917 didn’t involve color or sound, and that people moved in jerky ways. You’re confusing life in 1917 with the technology used to record life in 1917. This is a way of addressing, to some degree, the limits of technology at the time. Alternately, We’re left to puzzle over questions like: At what point in history humans began to run their wars in color and when our war machines began to generate sound? But it isn’t a more accurate rendering—it’s a simulation. The color and voices are not original—they’re guesswork. And the frame rate of the original footage, depending on the projection speed, was probably truer to life than Jackson’s 24fps “soap opera effect” trickery. So this is very much “sweetening,” rather than a restoration of original elements. No color in any photo is “original”. And these colors are much closer to the reality of the time than shades of gray are. As for frame rates, anyone who has ever watched people walk can tell which version is more accurate. I honestly can see no way to conclude that technology limits of 1917 manually-rolled cameras produces a more accurate rendering. Nobody ever walked like that unless they were performing a comedy skit mimicking an old-tech movie! There is strictly speaking no “soap opera effect” in the Jackson movie – that effect is what happens when hardware vendors include an option in their TVs & projectors to interpolate frames to go from 24fps up to 60fps or more. Motion pictures are trickery, they always have been so & there’s nothing “truer to life” about the low resolution, B&W, silent, variable speed original reels. Considering that this footage is being used for its documentary value, adding new frames to the footage is indeed less true to how the footage was filmed. Of course it’s less true to how the footage was filmed. It was made to show how it looked to the soldiers. Isn’t that worth doing? I think it is. Are you addressing me Rickflick with this: “Of course it’s less true to how the footage was filmed. It was made to show how it looked to the soldiers. Isn’t that worth doing? I think it is.” I haven’t made the argument you’re replying to [that I can see]. No Michael. I was replying to R60. So someone speaking the words is less accurate than no words at all? I just don’t follow your logic here. It would be different if the lip-readers were inaccurate but it doesn’t sound like you are saying that. The color is not entirely guess work. First of all they used experts in WW2 paraphernalia to aid in creating the colors of equipment. Much of this stuff is in museums so it would not have been difficult to obtain accurate data on color. Trees, grass and sky, yes to some extent would have to be approximate. But taken as a whole it’s giving the viewer a chance to see the war approximately as it was seen by the participants. I think that’s very much worth doing. If there are those who would appreciate the original material, they still have that available. Also, what happens to given colours when transformed into greyscale or B&W is somewhat undertood. Because war is more realistic in its original black and white? I haven’t been to war but I am pretty sure it is in color and horrible. This film does not address that issue. It is trying to provide and accurate record of how WWI looked and felt to participants. If you want to enjoy how it was captured originally, just look at the original footage. But you can’t provide “an accurate record of how WWI looked and felt to participants” without dealing with how WWI was captured on film, unless you have a time machine. Do you really need artificial color and ventriloquism to experience what those soldiers experienced? The short answer is “yes”. Watching Jackson’s film is closer to being there than the old footage is. That’s really the bottom line as far as I’m concerned. There are also undoubtedly documentaries on the filmmakers who risked their lives to get the original footage. And in my view, adding simulated color and sound takes one FARTHER from being there than the original footage—it’s a superimposition on what was originally filmed. Sexing up the footage takes it in the direction of virtual reality. But all films are tarted up. All are simulations. All are shot using he decision making of a person and edited through the decisions of another person (or the same person in a different role). The goal is sometimes to produce a complete fantasy and other times to produce a close facsimile. I don’t see this as any more a deception or fake than the original, just different and in many ways closer to the real thing it portrays. Isn’t that getting a little postmodern? It’s better to say that some films are more tarted up than others and some simulate less than others. If this footage was a total simulation, why would it have documentary value? This is nonfiction footage of real soldiers at a real battlefront, not fiction filmed in a studio with actors. I don’t see how Jackson’s manipulation makes this closer to the real thing. We’re not dealing with the actual color or sound of the real thing, just recreations added 100 years on, and they get between the viewer and the actual footage from the era. They’ve been slapped on to appeal to a mass audience that thinks black and white film is primitive. No it’s would be lost modern if i said nothing is real in the world. But a camera is not reality. That’s a simple fact. And I never said that a documentary was the same as a fantasy film. I said the complete opposite. Black and white film IS primitive. As far as I know, it is only used as an artistic medium nowadays. Cinematography in black and white film can be just as beautiful as anything in color—most of the best pre-1950 classic Hollywood films demonstrate that, particularly the films shot by James Wong Howe, John Alton, and Greg Toland. The technology might have been less advanced than color film, but the artistry wasn’t. Again, not what I’m arguing. I think this is beyond black and white though – the frame rate I find is the most disorienting when it comes to older films as it makes it seem cartoonish. I agree. The lack of color is not as important as the frame rate and jerkiness. What Jackson has done is simply made it a more realistic depiction of events. It also makes the soldiers more like guys in the neighborhood and less like alien beings. Since all renditions of earlier life involve technology, and not our own personal experience, it is hard for me to see how this work is not 100% positive. The film was shot using the old hand crank system, which means the rate is not constant. It would vary slightly(or worse) depending on the cranker. Exactly how this is corrected for I don’t know, but there is technology to generate completely new frames based on the frames just prior and just after the gap. This could be used to completely smooth out the frame rate. Also, note that one of the big improvements is that the specs and sparks, dust and scratches, which normally cover these old films is entirely erased. That alone makes the film much more watchable. In one of the short videos about the film, Jackson hints that the film speed adjustments were made by eyeballing it. You have not seen the film & neither have I yet. We can only honestly speak about what WE have seen & compare THAT to the critic’s reviews. Thus I’m relying on the clips in the video I posted at comment #2 [which is in 1080p HD on my screen]. “Less true to how the footage was filmed” is not what we are discussing! Given our [you & me] limitations – ie having not seen the material by Jackson on the big screen. There eally isn’t anything to say beyond personal preference. I have looked at the video clips & all I know is they look convincing [on the video] & I’m not trusting Silent London to tell me otherwise. I will wait & see. My girlfriend Sharron and I saw this in Blenheim (small town at the top of the South Island, NZ) a few weeks ago. It is an excellent watch. The colour is excellent and enhances the movie. There are some compelling moments… the youth of many of the soldiers, the terrible conditions for men and animals (horses), the drudgery of it all, mud and blood and the constant artillery bombardment. Of particular note was the odd occasion when a German mine would go off, presumably hit by an artillery shell. The mines must have been huge because the amount of soil that flew into the air was amazing as was the size of the crater. The movie is sombre and after watching it I wondered how anyone survived the front lines at all. I’m not sure how I would far watching this. Just the trailer moved me to tears. I am no fan of war, or the whole glory of sacrifice nonsense, but seeing those young faces lost to the vanity of others is profoundly moving.